In Leelanau county, the end of summer is bittersweet. Days spent under the warm sun listening to the lapping waves on the beach pass, and in exchange, we enjoy the crisp, cold morning air and vibrant fall colors. There is so much to love about each season in the Leelanau Peninsula. Autumn is by far my husband’s favorite time of year. Swimsuits are exchanged for sweaters; iced tea for warm apple cider; and the harvests come to an end as farmers settle down for a well-deserved rest. 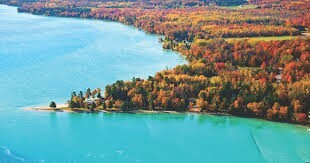 The most alluring part of the Autumn season in the Suttons Bay, Traverse City, and Leelanau areas are the color tours and the wine festivals. Many customers have asked what events take place after the summer season, so we have put together a list of a few of the most popular festivals and tours hosted in the area. While you are out and about exploring the county, colors, and wineries, stop in to visit us at The Bear Den! We have partnered with Michigan Warm Hugs Quilts, www.michiganwarmhugsquilts.com to offer a variety of snuggly, warm, Michigan-made blankets and quilts to keep our friends and customers warm on these chilly autumn days. This tour takes place in Leelanau any weekday during October. Tickets are only $10 – you get a complimentary pour at each participating winery -21 wineries participate-, a wine glass, and part of the proceeds from the event are donated to the American Red Cross. Each Thursday of the month, one of the wineries has extra swag and prizes for those enjoying the event. I have included a list of the participating wineries below. The Bear Den is on the corner of Hilltop and 22 and have enjoyed getting to know many of the participants. Along with our beautiful outdoor and indoor rustic décor, we offer rustic wine bottle and glass holders and other fun, unique gifts and souvenirs for wine enthusiasts. The end of wine harvest season is a time for celebration! Many wineries and restaurants do just that, offering delicious dinners with wine pairings or fine cheeses and wine pairings for enthusiasts. Blackstar Farms offers premium wine and cheese tastings on Tuesdays and Thursdays through October. Rove Estate Vineyard & Tasting Room offers 20% off all small plates and glasses of wine and cider all day long through December.